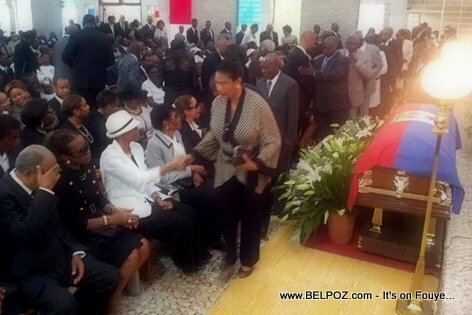 Members of Haiti's elite and former officials of Duvalier's regime arrived in luxury SUVs, joining more humble citizens in ill-fitting suits, and quickly filled the chapel on the grounds of the Saint-Louis du Gonzague school in the Delmas district of Port-au-Prince. Representatives for President Michel Martelly and Prime Minister Laurent Lamothe attended, though both leaders were outside Haiti on official trips. Also attending was former President Boniface Alexandre. Mercy fo the ex-President Jean Claude Duvalier. Jah love. How could these people attend the funeral of such an evil and wicked monster?